Randall Munroe, the young and famous author of the xkcd webcomic, has just released a beautiful knowledge visualization. 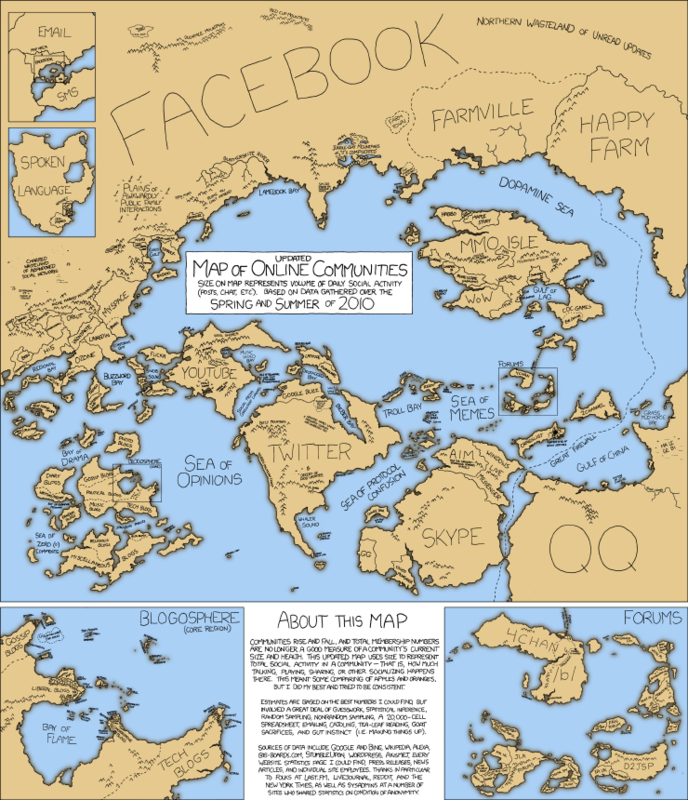 It’s the update of its online communities map. “Size on map represents volume of daily social activity”. The map is very well done showing both how the map is embedded into a bigger context (spoken language, email, sms, etc.) and providing as well zoom-in for the two hot topics of blogs and forums. It’s a nice mix of informative content, providing overview and details, and hilarious jokes of the Web 2.0 mania, such as “desert of food updates” on twitter, “people you can’t unfriend“, and “the great firewall” between China and the rest of the map! PowerPoint is under military investigation. The New York times reports: “We Have Met the Enemy and He Is PowerPoint” with an eloquent and provocative title, inspired by the so called spaghetti slide (see figure below). The leader of American and NATO forces in Afghanistan comment on the regards of this slide: “When we understand that slide, we’ll have won the war,” (NYT April 26, 2010). And he is not alone in thinking that Powerpoint is not the most suitable tool to display complex and relevant information for the military corps: the NYT article reports the complaints of a number of commanders, captains and generals. The Web is dead. Is it? In September (2010) WIRED has published a controversial cover with the headline “The Web is dead“, referring to statistics provided by Cisco on the share of Internet traffic by the Web and other applications. The article, several pages long, claims that “Two decades after its inception, the World Wide Web has been eclipsed by skype, Netflix, peer-to-peer, and a quarter million other apps” (pg. 119). It’s a remarable trand worth nothing, and the graph above certainly helps the reader to understand the point, however.. It depends on the perspective. Certainly the share of the Web is shrinking, but how about absolute numbers? Secondly, the graph is based on “traffic”, meaning quantity of information and bits exchanged, and clearly video and p2p application requires an exponentially higher volume of data than the Web for the same amount of time spent on the application. Swiss people are always efficient. Not to talk about Swiss trains, with their notorious punctuality and cleanness. Now they are going one step further, employing useful visual representations to decorate the train! Indeed they printed the map of the train route on the tables, so passengers can entertain themselves looking at the map, learn about Swiss geography, and always know what are the next stops. Switzerland is always ahead, so if they are using visuals on trains, I’m very confident this shows an upcoming trend! You are currently browsing the Sabrina Bresciani blog archives for October, 2010.